Think 'worship anthems' and it won't be long before you come up with a whole bunch of names of those who are part of the Kingsway family: Tim Hughes, Stuart Townend, Graham Kendrick. And if you're thinking songs, Blessed Be Your Name, How Great Is Our God or Shout To The Lord will soon be on auto-play in your subconscious. And all of the above can be found on this new album from Kingsway. The UK's Top 30 Worship Songs might not have the most creative title on the racks, but it doesn't need any gimmicks to help it make sense. Packed to the rafters with the 30 songs sung most frequently in churches this double cd contains the building blocks with which the church's worship is being strengthened, bit by bit. 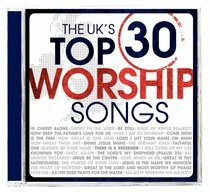 About "Uk's Top 30 Worship Songs"